The bible tells us that God’s love for us lasts forever. He has chosen you as His own people(1 Thes 1:4). We are told that we are knit together with bonds of brotherly love – and this love in Christ lasts forever. 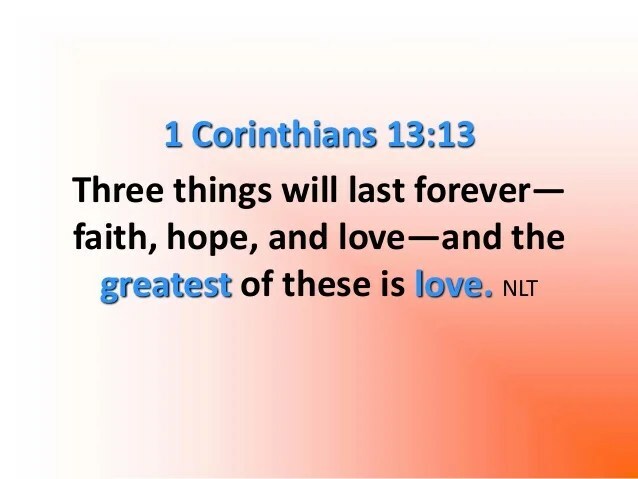 Jesus told us that three things last forever – faith, hope, and love- and the greatest of these is love. I can’t imagine a greater gift, it’s a gift that all the money in the world can’t buy. This is what it means to be rich in the things that don’t belong to this world. Could all the money in the world buy eternal salvation? Could all the world’s gold buy God’s love and mercy for us eternally? Could all the galaxies put together be enough to pay the price for us to enter the Holy of Holies before a perfect, just and holy God? Jesus made the greatest sacrifice for us – a love we can’t understand – that He would pay the price for us. If you read the Song of Solomon, you will read about a great love between a king and his bride. That love, that we can understand from an earthly standpoint, times infinity is the love that God in heaven has for you. We know that this world and all the things the world craves after will one day come to an end. (1 Peter 4:7) but the love we have from the Lord and for others will never end– it’s forever! According to scripture, when we die, the love we have for others is still alive- and it’s forever. Consider the verse in 1 Samuel 18:1- And it came to pass, when he had made an end of speaking unto Saul, that the soul of Jonathan was knit with the soul of David, and Jonathan loved him as his own soul. In Colossians, Paul talks about our hearts being knit together in love. If love lasts forever, then this knitting of believers in love also lasts forever. I guess you could say this is another way of seeing the body of Christ, Christ being the head. Also, a way as seeing believers as a vine or tree as described in scripture. The Jewish people being the branches and gentiles, by God’s grace, being grafted in as heirs, sons and daughters. This verse says that we are to grow together in strength and knowledge in Christ, the head of the body of believers knit together in love. Noah was a righteous man, the only blameless person living on earth at the time, and he walked in close fellowship with God Genesis 6:9. All this love stuff sounds great, but if we aren’t walking right with God, we are fooling ourselves. If we have all the gifts of God but don’t have love, we are nothing. If we could move mountains and speak the language of angels, but don’t have love, we are nothing. If we were filled with all wisdom and knowledge but didn’t love others, we are nothing. If we give to the poor and spend our time serving the church and others, but didn’t love others, we are nothing. You can boast about all these great things, but without love, you have gained nothing. Get rid of all bitterness, anger, sin and unforgiveness. Ask God to search your heart to see if there is anything hiding that has separated you from Christ. Are you holy ? You were created to be holy as He is holy. Are you lukewarm? Are you half in the world and its ways and a half baked Christian? It’s time to grow up, cut off the sins and the ways of the world and get right with God. Love Him with all your heart, draw close to Him and He will draw close to you. Grow in love, being knit together in love with other believers, bringing others in and snatching them from death. How awesome is God’s eternal love for us! How awesome that we are knitted together in love forever! May your love for others abound in Christ!